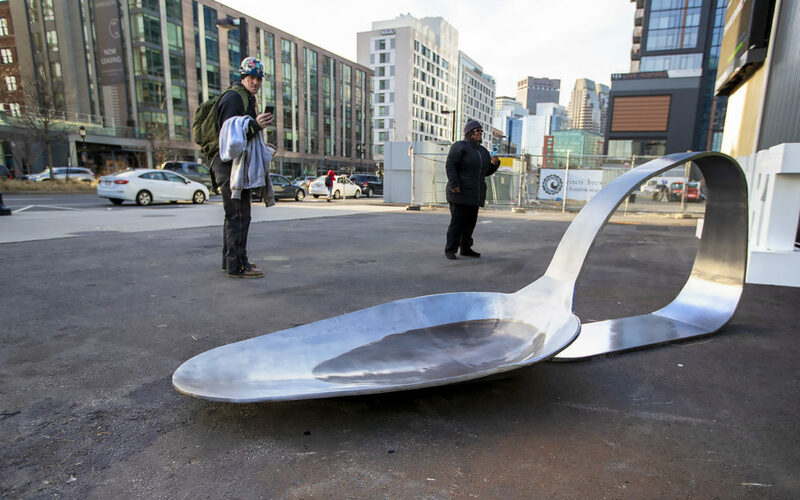 The spoon is massive, 800 pounds of steel, with a bent shaft that forms a handle and a blackened center suggesting prepared heroin. Built by artist, fabricator, and person in recovery, Patrick Lynch, this sculpture was recently given to Massachusetts Attorney General, Martha Healy, whose office has brought a lawsuit against Purdue Pharmaceuticals and members of the Sackler family who were involved in the marketing and selling of OxyContin, one of the drugs responsible for the current opioid epidemic. Members of the Sackler family are also named in a similar lawsuit brought by the City of New York. The Sacklers also own another opioid manufacturer, Rhodes Pharmaceuticals, which has also been targeted by the Opioid Spoon Project, which places the sculptures. This is not the only piece of art-based protest produced around the crisis. Photographer Nan Goldin, who is in recovery from her almost fatal opioid addiction after being prescribed OxyContin, has founded P.A.I.N. Sackler, an organization that stages theatrical protests at museums that have accepted donations from the Sackler family foundation and Purdue Pharmaceuticals, including the Smithsonian Institute, the Metropolitan Museum of Art, the Guggenheim, the American Museum of Natural History, and the Brooklyn Museum. P.A.I.N. Sackler’s mission statement demands that these museums and other institutions “remove Sackler signage and publicly refuse future funding from the Sacklers,” as well as, “demand that these institutions publicly disavow the Sacklers, and apologize for having whitewashed the reputation of this criminal family.” (It is worth noting that this blog is affiliated with Tufts University, which has also received large donations from the Sackler family.) P.A.I.N. Sackler does not differentiate between the branches of the Sackler family tree, because the Sackler name cannot be parted from the impacts of Purdue and OxyContin. In light of the recent legal and protest actions against the Sackler family, some institutions are beginning to reconsider their donation policies, including the Met, where a recent action by P.A.I.N. Sackler filled the eponymous gallery with prescription pill bottles. Massachusetts General Hospital removed the Sackler name from their Pain Center after the opioid crisis began. However, most arts organizations have not taken action, including the Smithsonian, which has a naming agreement in perpetuity for the Sackler Gallery of Asian Art. They have stated that they have no intention of changing the name, although their policy no longer permits perpetual naming agreements, meaning that if the Sacklers donated another wing to a Smithsonian, it would only carry their name for a generation. Like divestment movements before it, which call for organizations to refrain from investing in industries that are harmful to people or the environment, refusing donations from pharmaceutical companies that profit from addiction and inappropriate medical care is a tool that humanities organizations can use to signal their concerns. Art and culture institutions ostensibly care about documenting and showcasing the human experience, and though that experience may include pain, organizations need not profit off the pain and allow the culprits to launder their names in the process. Elizabeth Sackler, the daughter of Arthur Sackler, and namesake of the Elizabeth A. Sackler Center for Feminist Art at the Brooklyn Museum, has endorsed the actions of Goldin and P.A.I.N. Sackler while also distancing her father and her branch of the family from Purdue. Although the family protests blaming Arthur Sackler’s Foundation for the impacts of OxyContin, which was created after he died, the matter is not so simple. Arthur Sackler was a pioneer in marketing drugs directly to doctors, creating the modern pharmaceuticals industry that his descendants profit from. Indeed, the pending lawsuit facing Purdue and Sackler family members in Massachusetts has turned up internal Purdue memos from Sackler family members that show individual Sacklers were directly responsible for encouraging prescriptions of OxyContin while knowing about the addictive qualities of the drug. Other memos discuss the need to paint addicts as the problem and plan to push OxyContin as a safe alternative to Tylenol. Arthur Sackler’s shares of Purdue were sold to his brothers after his death. Had Arthur lived, keeping his shares of Purdue, who can say if his family branch would be as equally implicated in OxyContin’s sales. In a statement to the Washington Post, Sackler’s widow Jillian stated in part, “Arthur would be horrified to see how this drug has been misused and would be working to find solutions.” If that is true, perhaps the Sackler Foundation should be refocusing their efforts away from cultural organizations and toward harm reduction and recovery support. Maybe the donations they make should not come with named buildings and galleries to publicize and promote the Sackler name as pure philanthropic selflessness. Of course, they have the right to spend their money as they please, but perhaps museums and other cultural organizations should not help them side step more impactful charitable giving by accepting the donations. Excellent article! It will be interesting to see how this case impacts future giving/naming opportunities in museums.